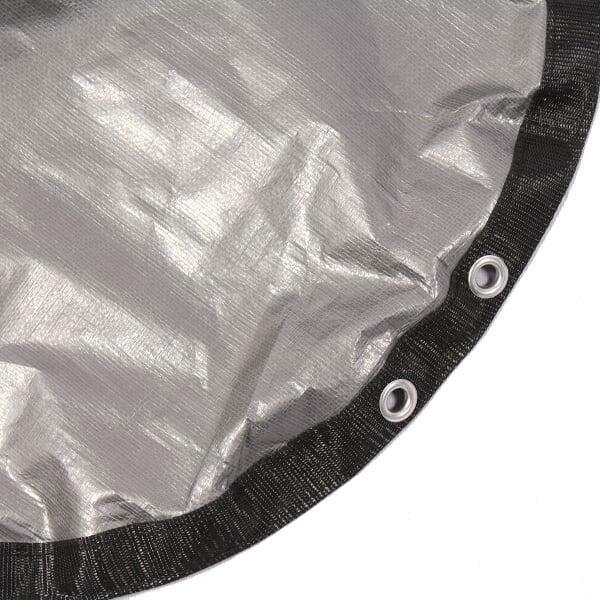 Description: With a higher SCRUM (thread count per square inch) than the typical winter pool cover, along with heavier and stronger stitching at meeting points, eyes and joints, the Extreme Silver Winter Cover offers a longer life, and a longer warranty, than the Supreme Green Winter Cover. Extend this winter cover over that above ground pool when closing for the cold season. The pool cover should fall over the perimeter of the pool for a snug and secure fit. Function: Winter pool covers protect the pool water from dirt and debris while the pump and filter is turned off during colder months. It creates a protective shield that prevents evaporation by the sun of expensive winter chemicals. In addition, an effective pool cover thwarts dirt, debris, phosphates and airborne particles from entering the pool. The bottom line: winter pool covers will grant an easy open in the spring, devoid of green and gross water. Note: Actual dimensions for winter pool cover diameters are 4' longer than the above ground pool size (18' Pool Cover actually covers a 22' size area). In order to order the right pool cover, one must know the pool's size. Round 24' pools require a 24' round winter pool cover. Round 33' pools require a 33' round winter pool cover.